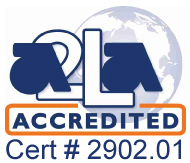 BrandTech Scientific is a company that continually extends the boundaries of what’s possible in liquid handling performance. Their commitment to constantly improving product quality is highlighted with each new solution in their ever-increasing product range. This commitment to product quality and innovation has led the company to the creation of a new solution for bottletop dispensing applications. For those laboratories working to keep costs low and streamline their dispensing work with the latest in high-performance technique, the BrandTech Seripettor Pro Bottletop Dispenser is the trusted product within the marketplace. Precise and fast dispensing with the BrandTech Seripettor Pro Bottletop Dispenser can help today’s growing labs and companies achieve ever-improved results within their testing and research applications. For this reason, companies are now looking towards the BrandTech Seripettor Pro Bottletop Dispenser as the product to resolve their range of application challenges. One of the leading features built-into the BrandTech Seripettor Pro is the product’s spring-driven refill functionality, which helps support semi-automatic refilling operations that empower seamless working efficiency for users. The BrandTech Seripettor Pro Bottletop Dispenser also features a notched volume selector, to help mitigate issues with volumetric measurements by ensuring the exact amount of liquid is extracted and dispensed. The BrandTech Seripettor Pro Bottletop Dispenser can help workers perform quick adjustments during complex research work. Standout efficiency has never been this easy to achieve for today’s lab workers. The BrandTech Seripettor Pro Bottletop Dispenser is the requisite choice for dispensing solutions such as weak acids, polar solvents, alkaline solutions, methanol and acetylacetone with exceptional dependability. This bottletop dispenser holds a competitive advantage in that it features an innovative compartmental design that permits the simple assembly of the product while also allowing for quick replacement of worn parts. This helps to both extend the lifetime performance of the BrandTech Seripettor Pro Bottletop Dispenser and ensure that the system is ready when needed. The BrandTech Seripettor Pro Bottletop Dispenser is designed to handle a wider range of liquids than the regular Seripettor, for customers who do not require all the features of the Dispensette. Like the regular Seripettor, the BrandTech Seripettor Pro Bottletop Dispenser features an easily-replaceable wiping seal dispensing cartridge, making it especially suitable for liquids that tend to form crystals. Its pump assembly has a corrosion resistant spring and an opaque upper sleeve to protect reagents from UV-light during dispensing, while allowing for observation of reagent to confirm purging of bubbles. 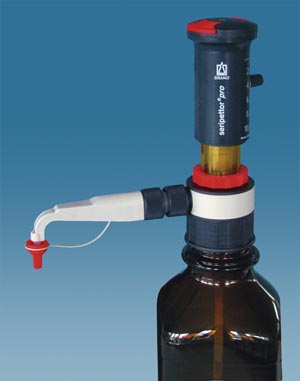 The BrandTech Seripettor Pro Bottletop Dispenser mounts on most common reagent bottles with its 45 mm thread. The seripettor pro is a bottletop dispenser designed to handle a wider range of liquids than the regular seripettor for customers who do not require all of the features of the Dispensette. Like the regular seripettor, it features an easily-replaceable wiping seal dispensing cartridge, making it especially suitable for liquids that tend to form crystals. Pump assembly with corrosion resistant spring. An opaque upper sleeve helps protect liquid from UV-light during dispensing operations, while permitting observation of cylinder to confirm purging of bubbles. Temperature of instrument and reagents must be between 15° and 40°C (59° and 104°F). Agar culture media to 60°C (140°F).